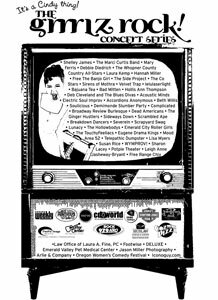 Check out some info from the second year of Grrrlz Rock. Hello all you fabulous Grrrlz!, I can't believe it's all over. November ended two weeks ago and I'm just now catching my breath! WOW! Thank you for an incredible Grrrlz Rock this year. Your gift of time and talent made it possible. We've inspired women, girls and those who love us, to support women in music I'm sure. The Grrrl Talk workshop/panel was great too! This year we more than doubled the number of bands and the number of shows as last year's event. We also had much more advertising and a held a successful guitar giveaway (to a guy named Don). We added a bit of a donation to make the Guitar funds reach $1,000 which went to the WOW hall's educational fund. 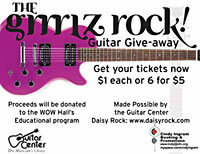 The winner (Don) then wrote a check for $500 to sweeten the deal.. so $1,500 was raised by way of the Daisy Rock! ).